How well do SA’s white wines mature? In attempting to explain this state of affairs, Sadie suggested that the modern-era marketing drives undertaken by the three red-wine producing regions of Bordeaux, Tuscany and Napa, California had basically dictated terms. Ethereal nose of citrus, flowers, a certain chalkiness and some leesy character. Pure and focused on the palate with a long, pithy finish. Still extraordinarily youthful but not particularly detailed. Deep amber in colour. 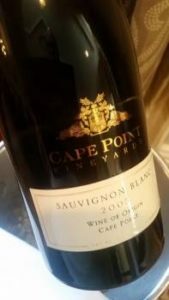 The nose appears particularly developed with notes of marzipan, oatmeal and nuts but the palate still shows good fruit. Rich and weighty with tangy acidity. Very much tertiary in character but complex and engaging. Complex nose showing lime, green melon, fynbos, a hint of asparagus and honey. Rich and smooth textured but balanced by tangy acidity, the finish pleasantly savoury. Lime, pear, white peach and green melon on the nose and palate. Weightless intensity, wonderful poise and great length. All of a piece. 70% Semillon, 30% Sauvignon Blanc. A herbal top note before lime as well as undercurrents of green bean and asparagus plus oak-derived vanilla and age-derived honey. Still very much together but lean and perhaps a bit joyless. Stone fruit, some earthiness and subtle spice on the nose and palate. Rich and broad with moderate acidity and a savoury finish. A real sense of this wine being untarnished by time and set to remain on a plateau of drinkability for a long while. A blend of Chenin Blanc, Grenache Blanc, Viognier, Roussane and Chardonnay. Notes of cut apple and spice on the nose and palate. Rustic but pleasingly so – broad on entry but comes to a point. If I remember correctly that 91 Swartland sauvignon was champion white at the young wine show. It was from a vineyard that’s now in Darling. Hi Angela, Eben was in full cry but as I gathered, it was the General Smuts Trophy winner that year. The vineyard, however, seems to have been the Amos block on what is now Spice Route.